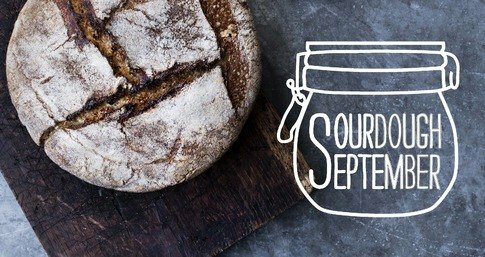 Throughout this month, we are celebrating Sourdough September at Sharpham Park, supporting The Real Bread campaign in their quest to share the delights of genuine sourdough with everyone and to encourage more people to buy and make their own. We are passionate about using only the finest organic ingredients and our Spelt Flours enhance both the complex flavours and nutritional value in a loaf of sourdough. Two excellent reasons to give it a go. A genuine Sourdough is made with no additives or bakers yeast, no longer the preserve of bread aficionados, its crackling crust, sour tang and nutty flavours are now widely adored an appreciated from the kitchen table to local farm shops. Freshly baked, warm and sweet smelling, this artisan loaf can certainly rise to any occasion. Making a sourdough loaf is both a science and an art with a little bit of mystery thrown in for good measure. The ultimate slow food, this ancient leavened bread has been enjoyed and shared for centuries. The magic of capturing and taming the wild yeasts drawn from the atmosphere to make the ‘starter’ or ‘ferment’ and the measured nurturing process involved is all part of the alchemy. Each loaf is as unique as the day that it is made, it is the friendly lactic acid bacteria that give the bread its distinctive sour flavour and moreish taste. The combination of Spelt flour, a long fermentation process and the lactic acids, make sourdough easier to digest than conventional breads and allow the good nutrients in Spelt flour to be more easily absorbed by the body. Try your hand at making this wonderful bread you will be bewitched by the magic and mystery and hooked on the flavours and feel good factor of sourdough. Find Spelt Sourdough recipes and some great advice on our website and in Roger Saul’s cookery book ‘SPELT’ which is available in The Great House at Kilver Court and online.